Climate change and justice are so closely associated that many people take it for granted that a global climate treaty should--indeed, must--directly address both issues together. But, in fact, this would be a serious mistake, one that, by dooming effective international limits on greenhouse gases, would actually make the worlds poor and developing nations far worse off. This is the provocative and original argument of Climate Change Justice. Eric Posner and David Weisbach strongly favor both a climate change agreement and efforts to improve economic justice. But they make a powerful case that the best--and possibly only--way to get an effective climate treaty is to exclude measures designed to redistribute wealth or address historical wrongs against underdeveloped countries. 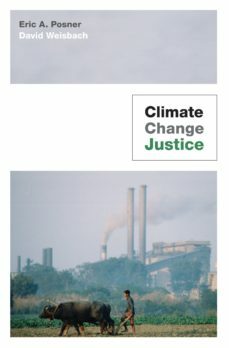 In clear language, Climate Change Justice proposes four basic principles for designing the only kind of climate treaty that will work--a forward-looking agreement that requires every country to make greenhouse--gas reductions but still makes every country better off in its own view. This kind of treaty has the best chance of actually controlling climate change and improving the welfare of people around the world.